Lightweight with Tons of Power for Any Gig! The QSC KW122 powered loudspeaker builds on the immensely popular QSC K12 speaker, adding a few key upgrades that make it an excellent fit for larger venues. 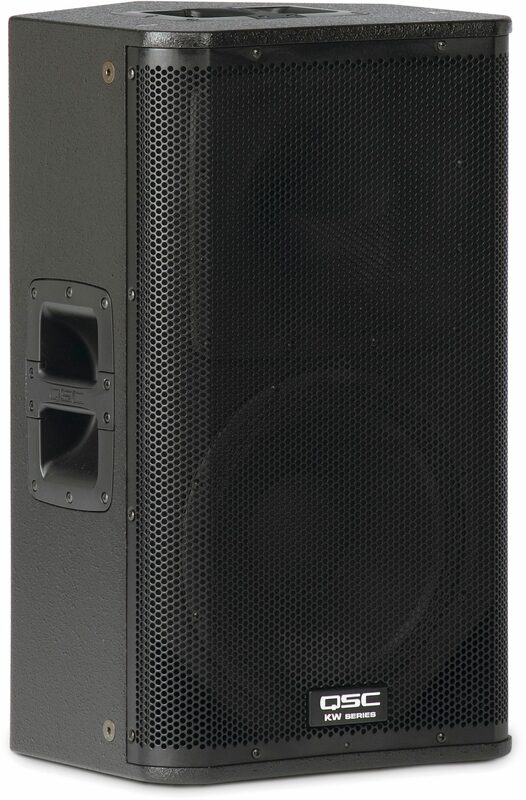 While the KW122 and K12 are both 1000-watt 2-way 12" speakers with a 75-degree coverage angle, the KW series offers a few key upgrades not found in the QSC K series. The KW122's enclosure is made of machined birch plywood with aluminum handles, while K series enclosures are high-impact ABS molded plastic. While wood is heavier, it simply sounds better. To accommodate the KW122's larger tweeter horn, its birch wood cabinet is 26 inches tall and weighs in at 49 pounds. And of course, this speaker is packed with all the powerful DSP that QSC is known for, from DEEP and Vocal Boost processing to GuardRail limiting. QSC's KW series speakers are made to be splayed. While K series speakers project sound in a cone-shaped pattern, KW series speakers like the KW122 project an axis-symmetric pattern with a more square cross-section. In plain English, KWs lend themselves to being grouped in a cluster of 2 or more speakers, because the square pattern edges match up with each other -- helping to blanket a large venue in consistent sound. Even if you're starting out with a single pair of KW122s, these speakers make an excellent starting point for a PA that you plan to expand in the future. The QSC KW122 can simultaneously accept mic, line, and stereo RCA inputs, mix all 3 inputs within the speaker, and then send output to a second daisy-chained KW122. If you're installing a PA that will be fed by multiple mixers, the ability to connect all those inputs is a big plus. 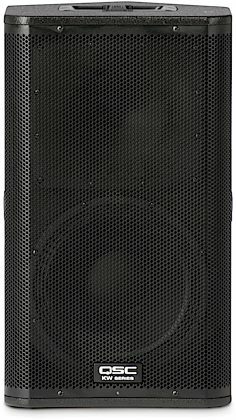 As part of QSC's KW series, the KW122 is a powered, active speaker with 1000 watts of lightweight Class D amplification. These speakers' built-in Class D power amps employ QSC's Guardrail limiter to prevent destructive clipping distortion and woofer over-excursion, while a virtually silent internal fan turns on when the amp senses high temperatures -- making the KW122 truly robust. To get impressive bass output from 1000 watts, the QSC KW122 employs DEEP: Digital Extension and Excursion Processing. Flip the DEEP switch on the back of your KW122, and this virtually transparent limiter kicks in to increase the average output of bass frequencies. Much more than just a low-frequency EQ boost, DEEP employs sophisticated DSP to identify and limit brief low-frequency transients while preventing distortion. The QSC KW122 loudspeaker lets you control high frequencies with application-specific EQ settings. Set the HF switch to "Flat" for full-range music, or "Vocal Boost" for increased intelligibility and presence for speech or vocal reinforcement. In addition, QSC's Intrinsic Correction EQ implements FIR linear phase filters to adjust the speaker's response, helping deliver consistent sound over the entire audience. QSC has set the standard for lightweight powered PA loudspeakers with their industry-leading KW series. 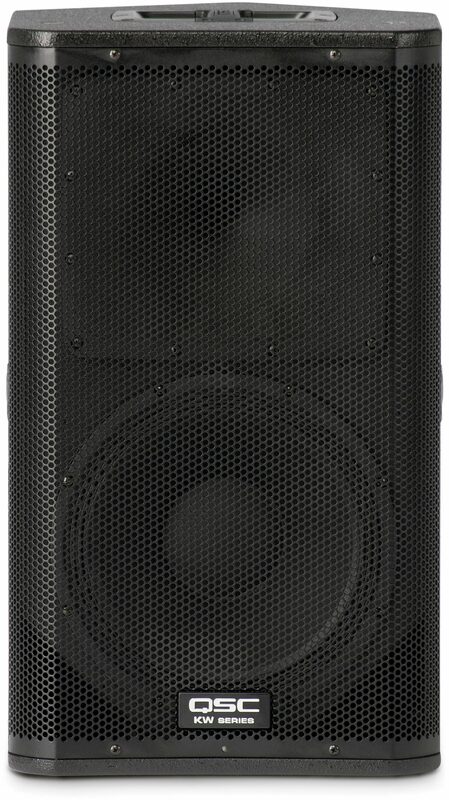 With 1000 watts of room-filling sound, QSC KW122s are an excellent choice for full-range PA speakers. Building on the success of QSC's K Series, the KW122 represents the next evolutionary step in wood enclosure loudspeakers. QSC system engineers have created the KW122 to feature all the groundbreaking electronic attributes of our popular K Series while at the same time designing a product that is both smaller and significantly lighter than previous wood enclosure models. Like K Series, each of the four KW models features a QSC designed, 1000 watt (2 x 500) Class D power module. And continuing in the K Series tradition, every model is fitted with the identical high-output 1.75" HF device (full-range models) and woofers of the same high quality design, regardless of speaker size. The KW122 features a four-position mic/line gain switch that allows for connection of a wide variety of devices. Combo XLR and 1/4" TRS inputs accept both mic and line level input while a set of RCA phono inputs allow additional connectivity to portable MP3 players, CD players and line-level mixers. Up to three audio sources can be mixed internally and summed to a balanced output for "daisy-chaining" of multiple units. Separate direct outputs are also provided on each channel for additional output flexibility. On-board switches provide preset EQ settings. The HF setting (full-range models) can be set to Vocal Boost for additional presence in the critical mid-frequency area or Flat for accurate reproduction of the incoming signal. The LF switch can be set to Norm, Deep(TM) for additional bass extension, or Ext Sub (full-range models) for use with an external subwoofer. The rear panel LED switch can be set to Power, illuminating the front-mounted LED when the unit is powered on, Off for applications where it is not desirable to illuminate the front LED, or Limit which indicates to the system operator that the clip limiter circuit has been engaged during operation. The KW122 features a unique Tilt-Direct pole cup mounting system. A simple turn of the dial engages a 7.5 degree downward tilt of the speaker allowing acoustic energy to be kept on the audience and off reflective surfaces for applications where maximum coverage from a high-positioned speaker is desired. Remote gain control capability is offered via a potentiometer (not included) connected to the on-board Phoenix-Style connector. In an installed application, multiple KW122 speakers can be "daisy-chained" for total gain control from a single remote pot. Auto-standby mode is engaged after 5 minutes of inactivity. The KW122 is designed to withstand the rigors of professional use. Advanced construction processes, premium-grade Baltic birch cabinetry, ergonomic, cast aluminum handles, and a highly protective steel grille provide for ease of transport and long term durability. Integrated M10 suspension points allow for flown applications with a KW M10 KIT (sold separately). Sound: The sound is clear with no distortion. I play Hip-Hop and R&B and it handled everything I threw at it like a champ. The Deep feature works just as advertised. Someone asked me where I hid the sub and I laughed and said there is no sub. Just 2 12's pumping out bass. Feature: The many available inputs that can be used is definitely a plus. I can hook up my Mic while the speakers are connected. Connect an iPod or other device with the Aux jacks. Adjustable gains, the Deep feature, and increasing the trebile. Even being able to change the power light to off, limiter, or full bright for power. Ease of Use: Best way to describe is by saying too easy. My 2 year old son could probably plug in the cables and adjust the gains if needed. Quality: I was very pleased with the cabinet being coated the way it is. I scraped it on accident and there was no discoloration or paint chipping off. It doesn't feel flemsy and is pretty stable. Value: After going to Guitar Center to listen to all the brands they had available, I was sold on the QSC's. I was going to get the K series but decided that a wood cabinet would probably sound and look better. I'm not a fan of expensive plastic things so that also made me go up to the KW series. Manufacturer Support: Haven't had to contact them at all. The Wow Factor: The sound alone will WOW you. I would say that JBL would probably come next in sound to these. When people compliment my setup then I know in some way they are impressed while they are being entertained. Overall: I've only been DJing for a few years now and I've had these for 2 years but never used them since the places already had equipment set up. Well I had to do a graduation party in Atlanta Memorial Day weekend and man oh man was I satisfied. I was concerned that these speakers may not fill, the room but after setting them up I realized I had nothing to worry about. Set them up at an angle to hit the crowd and walked away. I threw on an instumental and walked back to the entrance of the room and was pretty much blown away at the sound, clarity, and the distance from where I was in relation to the speakers. It was a pretty nice size room. People complimented the sound and even asked if I had a sub hidden back there somewhere. I laughed and said no. They were satiisfied with the sound coming from these bad boys. I play Hip-Hop and R&B and the thump from these boxes were great. No clipping of the audio whatsoever. Crystal clear sound production. I used the Deep setting to help with the bass and was pleasently surprised. I don't really know what else to say other than to buy them. Even though the price is a little steep, the warranty more than makes up for it in my opinion. Hopefully I never need the warranty but it's nice to have if I do experience any issues down the road. Overall: Our band bought these to replace some under-power rated JBL's and some old bulky Cerwin Vegas. We were totally blown away by the sound, clarity and volume from these speakers, especially since they are actually smaller than our previous ones. We have been getting a lot of compliments on the new sound. I am just looking for a reason (i.e. bigger gigs!) to by the matching subs. These speakers rock!! Plus I was able to take advantage of the factory rebate and got two heavy duty speaker covers FREE! Saved about $300!! Style of Music: Our band plays Classic Rock.